Today, the stars are aligned. At the Red Cross, we are fortunate to work with our celebrity donors and volunteers, as well as many television and film partners. Each day, they bring us creative ideas about how to alleviate suffering and save lives through the powerful and creative influence of the entertainment industry. They sing songs that inspire people to take action, they donate a percentage of their concert ticket sales, they integrate the story of our mission into their shows and movies, and they visit disaster shelters to lift the spirits of people who face rebuilding their lives. And, much more. We are often asked about our celebrity partners, “Do they know how lucky they’ve got it?” Our answer: a resounding, “Yes!” Most days, they exhibit staggering generosity and remarkable humility, and they want nothing more than to “pay forward” their own good fortune. They are humbled by what they’ve been given in life and display a deep commitment to make it matter. Based on each of their own unique talents and interests, they donate millions of dollars, countless hours, and gallons of blood in support of our mission. Today, they come together for one common purpose on #GivingTuesday – to celebrate the stories of survivors and heroes who have been touched by our mission. As volunteers who support our lifesaving work on a regular basis, our celebrity partners know that the real stars are ordinary people who use CPR or First Aid skills, donate blood, survive tornados, stand by a military spouse, or escape the perils of war in areas of great conflict at the cost of being separated from their family. So that we might all be inspired by the stories of these “ordinary” heroes, each celebrity has chosen one story to celebrate today with their fan base to inspire people to #givewithmeaning. On Twitter, Facebook, and Instagram, you will see them highlight one person who has survived or thrived in the face of a life-threatening situation. For Trace Adkins, whose family experienced their own home fire three years ago, it was Angelina Perez, who was four months pregnant with her second daughter when her NY home caught on fire. 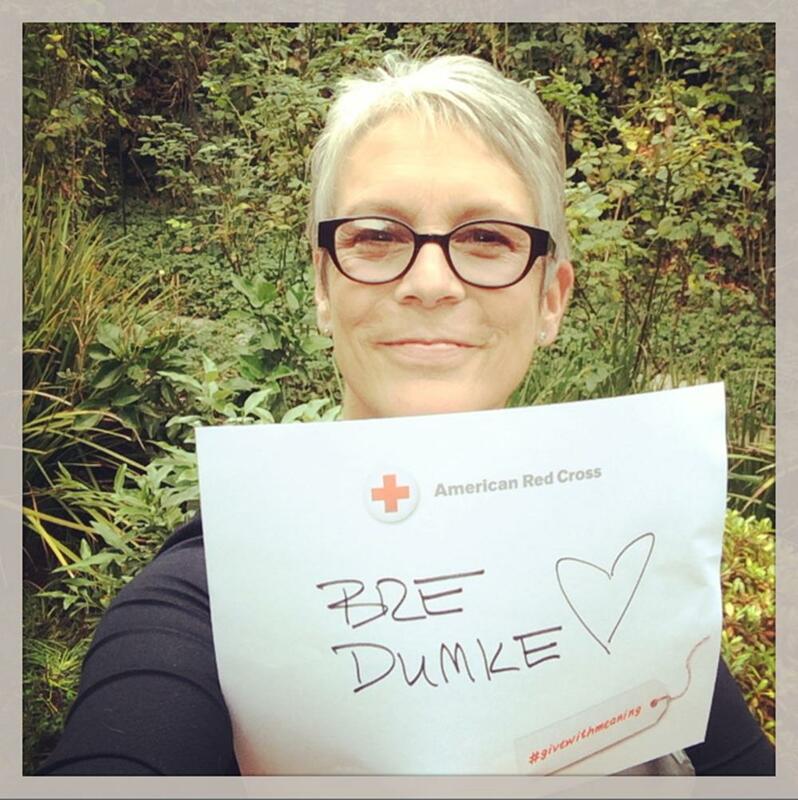 For Jamie Lee Curtis, who has been an active advocate for earthquake preparedness in LA and learning lifesaving skills, it was Bre Dumke, whose life was saved by her best friend, Julie, when she was injured in a hiking accident after falling on a rock and tumbling 70 feet in the snow. For Heidi Klum, well… she simply couldn’t pick one story, so she’s celebrating them all. If you want to be among the stars, tell your Red Cross story. RT a #givewithmeaning link from your favorite celebrity, pick a favorite story to highlight, or make a donation in celebration of #GivingTuesday. You may even get a personal Twitter “thank you!” from your favorite celebrity. Shine on and #givewithmeaning!